Audi A8 hybrid on show at Geneva | What Car? Audi will reveal a petrol-electric hybrid A8 concept car at the Geneva motor show next month. The company says it doesn't believe in 'mild hybrids' which run the car for only a few seconds around town before the petrol engine kicks in, or just boost the engine's power when on the move. The hybrid A8 will have a range of 3 - 5km using electric power alone, making short journeys feasible without having to call on conventional engine power. When can I buy a hybrid Audi? Audi's hybrid technology has already been developed, and the first production car to get the dual-powered engine will be the Q5. Orders for the car will open towards the end of this year. The production hybrid A8 is expected to follow in 2011. 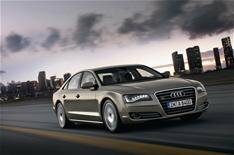 From launch, the new A8 will be available with a 4.2-litre petrol and 4.2-litre diesel engine. Both four-wheel-drive models are available to order now with deliveries from May. A four-wheel-drive 3.0-litre diesel is also available to order now, and deliveries will start in August. From November, a two-wheel-drive 3.0-litre diesel model will offer buyers a cleaner way to travel. It will feature engine stop-start technology, and will do an average of 47.1mpg, while emitting just 159g/km of carbon dioxide. Audi is also developing a plug-in hybrid model, which should have an electric-only range of nearer 30km.